Ramadan is literally 2 weeks away! Doesn’t time pass by so fast? Many of us have a hard time eating well in Ramadan. We are so tempted by decadent desserts and carbs for days. The fact that we eat later in the evening also doesn’t help. In fact, most people gain weight during this holy month. That is one of the reasons I’m starting a Ramadan series on my blog; to share with you healthier options to foods we already love. You can find all the dishes under the Ramadan category. Many of us wake up for suhoor but are half asleep and don’t care to actually make a meal. These parfaits can be made the day before and eaten just in time for suhoor (time to eat/drink before fajr prayer). They are also good for you and very filling! 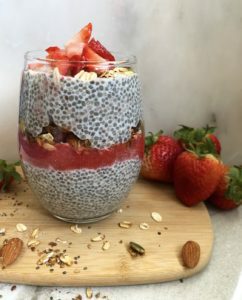 The chia seed pudding is loaded with fiber and super versatile. You can pair it with any fruit really and it will taste amazing. I show you two variations to this. 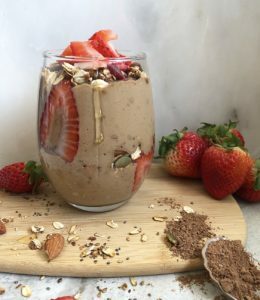 I also share with you a chocolate avocado banana pudding/smoothie. The fact it has avocado adds good fats into your diet early morning helping you stay full. The homemade granola in all the parfaits also makes it more hearty and adds some texture. Nuts and oats are packed with good carbs. 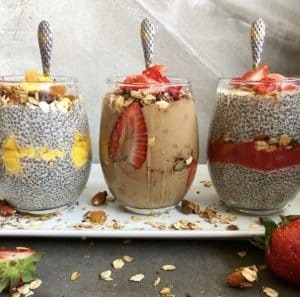 I hope you enjoy these delicious and super simple parfait ideas that are sure to make a perfect suhoor, snack, or light dessert. 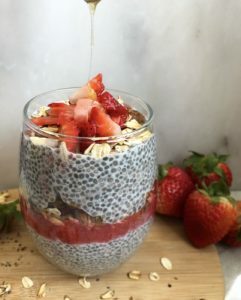 In a bowl, add the milk then chia seeds and sweetener of choice. Mix all together. Set aside for 5-10 minutes then mix again. Cover with plastic wrap and place in the fridge to set for at least 2 hours. 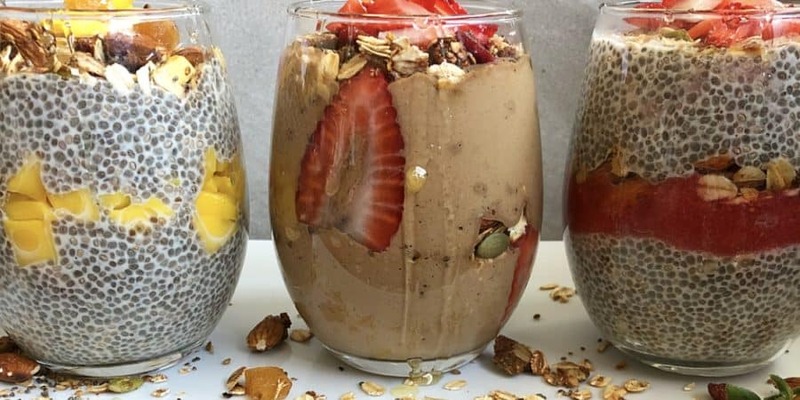 *Tip: You need 1/4 cup chia seeds to every 1 cup of milk. This measurements should help you adjust how much you want to make. In the meantime, finely chop some strawberries and mangos. Also, in a blender, puree 1/2 cup of strawberries with 1 tsp of honey or any sweetener. I used raw orange, honey. The orange adds amazing flavor. I recommend adding orange zest & juice if you do not have orange honey. It adds an extra depth of flavor. Place in a small bowl and then in the fridge to cool. Also, prep the granola which takes no more than 10 – 15 minutes. Here is the link to my healthy granola recipe. Just press on the blue hyperlink to take you to the recipe. You can layer as you please. There is no distinct way. It is up to you. I did chia seed pudding and granola with mangos in one. Then chia seed pudding with strawberry puree, strawberries, and granola in another. I topped both off with honey. Add all to a blender and blend for 30 seconds. Adjust sweetness as needed. Slice 1 strawberry very thinly. Attach it to the inside of the parfait glass randomly. It will stick. This is only if you want to be fancy. It’s an extra step. Finely chop another strawberry as the garnish for the top. Layer in granola in the parfait as well.